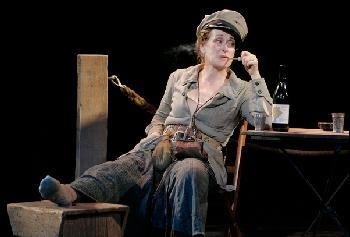 A mix between Gesture and attitude- how you physically embody a character and what it says about them/ their motives. Here, Shen Te in The Good Person of Szechuan discusses with the audience the nature of having to pretend to be a man in order to get her own way. 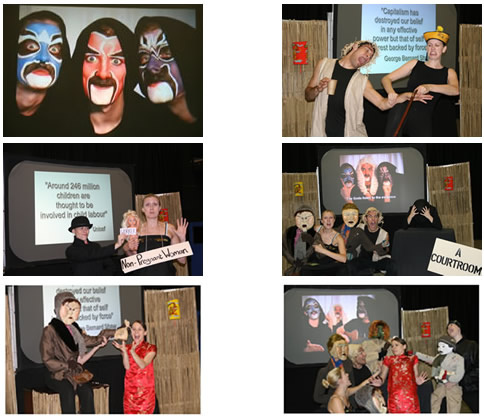 Characters are shown using- Gestus, Representational costume and gestus. Sometimes he would use the notion of a 'play within a play' where actor would play a character that portrays further characters to tell the story. 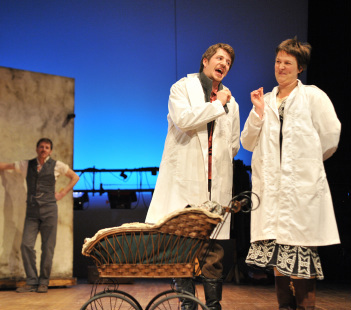 Here two actors in Caucasian Chalk Circle wear doctors white coats to play 'Doctor 1' and 'Doctor 2', but still wear underneath their other costumes. This helps to remind the audience they are still actors simply representing a character. 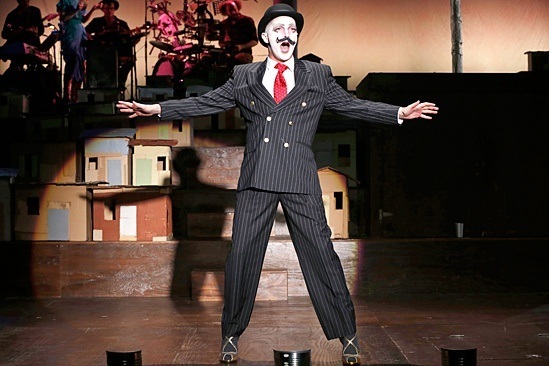 This also allows for fast changes in an ensemble, meaning an actor can instantly represent a new character by simply putting on a hat. This word means 'fun' in German. Brecht's early plays were a bit dull as they only focused on their political message. 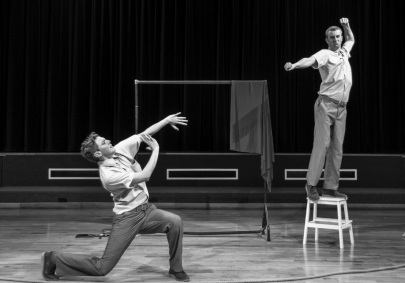 This put off audiences, so Brecht decided to make his plays more satirical and comic so that the audiences would be drawn in by the fun. 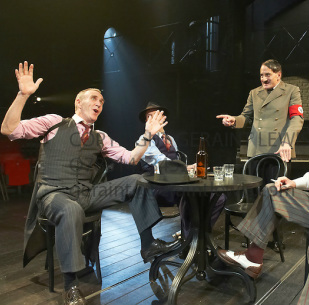 For example in this picture from The Resistible Rise of Arturo Ui the audience are led to believe they are watching a comic play about a hapless gangster, only to slowly realise the play is about how Hitler managed to take control by appearing harmless. The effect of this is that the audience want to pay attention as they are enjoying themselves and then the contrast when something serious happens has a great impact and that makes the audience shocked by it- emphasising the message. Placards are used to give clear messages to the audience- they may be held by an actor or projected. for instance, in this video of the film version of Brecht's play The Threepenny Opera Roger Daltry sings an upbeat song called 'Mac The Knife', cheerfully grabbing children onto his cart and smiling with them; but actually the song is about a man named Macheath, who within the song murders atleast 4 people and assaults several women. 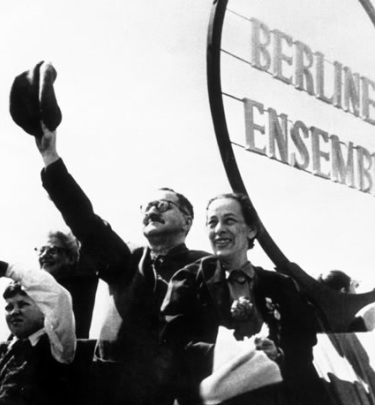 By setting his plays in different countries and time periods, Brecht was able to allagorically make comments about issues in the present. As he had set it in a different time period, the audience were not immediately aware of what the social comment was- meaning he could draw them in before tryign to make them question their opinions.